My PhD thesis Nanometrology using Time-Resolved Fluorescence Techniques may be found here. My thesis covers Fluorescence Spectroscopy and Fluorescence Instrumentation in quite some detail. This guide continues on from Steady-State Fluorescence Basics. Note: Hold down [Ctrl] and left click the images or animated GIFs to see them in more detail in a new tab. White light interacting with a prism and being split into its individual components (colours). Light is a wave as shown. We use English names to refer to the colours we can see… A more advanced specification of light is its determination by wavelength. Note in the above schematic the distance between two maxima (the wavelength) is longer than that in violet. Wavelength is typically specified in nm with 1 nm being 1 millionth of 1 mm! Light of shorter wavelength has a higher frequency and hence more energy than light of longer wavelengths… An analogy is a 10 km run as the crow flies in Toronto compared to the Scottish Highlands… It takes far less energy to run in flat Toronto than continuously up and down the hills and valleys of the Scottish Highlands. Illustration of a grating in a monochromator of a HORIBA Scientific FluoroLog 3-22. Light from the Xenon lamp (white light – all wavelengths) enters through the entrance slit and is focused onto a grating (performs a similar function to the prism shown before) using an entrance mirror. The grating splits the light into its individual wavelength components or spectrum similar to a rainbow. Light of a specified wavelength (colour) is directed to an exit mirror and allowed to pass through the exit slit. The rest of the wavelengths hit the wall of monochromator and are hence rejected. HORIBA Scientific manufacture gratings and monochromators for those interested a HORIBA Scientific Grating Tutorial is available. Because gratings typically let through light of 2nd and 3rd order for instance when the grating is set to 750 nm, light of 750 nm is allowed through and to a less degree light of 375 nm and 250 nm respectively. A series of optical filters longpass (only lows light through above a certain wavelength), shortpass (only allows through below a certain wavelength) and bandpass filters (only lets light through between certain wavelengths) may be used in conjunction with a monochromator. Using a monochromator and Xenon lamp can hence control the colour of the light which we wish to use to look at a sample. The most well-known detector of light is the eye. The eye works well in the so called visible range with a maximum response in the green. It does not operate well in the NIR or UV. This is a picture of me taken using a standard camera. The settings on a standard camera are set to match the response of the eye as most consumers want photos of their friends which resemble what they normally see. This is a picture of me taken using a NIR camera which of course has a completely different wavelength response and as a consequence I look completely different. Note false visible colour is used on the NIR image (so we can see and contrast it). False colour is often used in many applications so we can compare and contrast results. The first measurement we can carry out is an absorbance measurement which is the comparison of the amount of light reaching a detector in the presence and absence of an object. If you have ever put on sunglasses you have carried out an absorbance measurement… in this case the light source is the sunlight, the object is the sunglasses and the detectors are your eyes. Sunglasses appear relatively dark to the eye as they absorb a large proportion of the light they however do not absorb everything as we can still see through them when we have them on. A more sophisticated absorbance measurement can be measured in a spectrophotometer (that is essentially a white light source, monochromator, filters and a detection source). The first step is looking at the energy scan of the blank signal which reaches the detector to ensure there is sufficient light at each wavelength in order to carry out an accurate measurement. 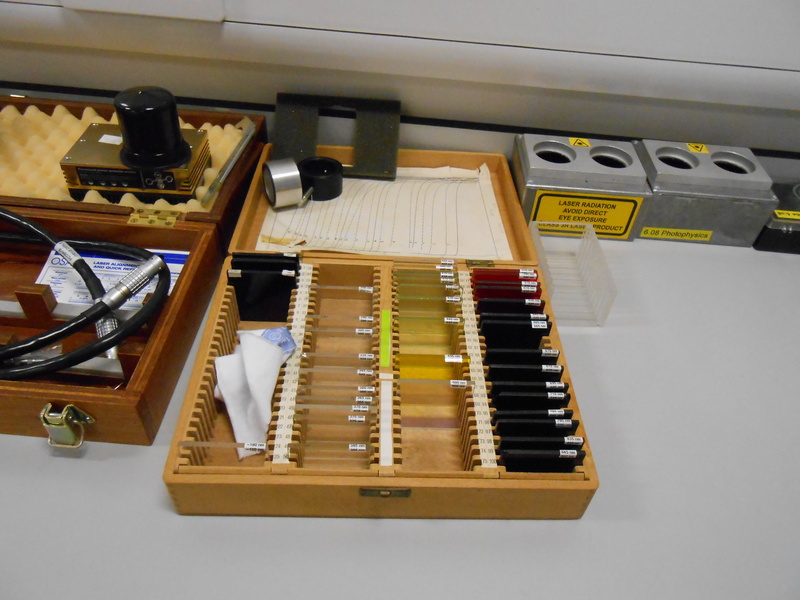 One may then put a sample of interest into the spectrophotometer and a control sample to account for the absorbance of the container holding the sample and solvent for instance if the sample is suspended in water and measure an absorbance spectrum. The absorbance spectrum or related transmission spectrum may be used to characterise a sample although a simple dye (Rhodamine 6G) in solution (ethanol) is used, samples may range from almost anything in solid (e.g. a leaf, sunglasses), liquid (e.g. water, Irn-Bru, whiskey, wine, beer) or gas form. Note: An absorbance spectrum is a relative ratio and as a consequence any wavelength dependence of the optics divides out (discussed later). A sample may interact with light in a number of ways… As we are interested in emissive processes I can demonstrate most these processes using some basic samples and one of our green DeltaDiode lasers at 510 nm operating at 100 MHz in a DeltaPro sample chamber. The appearance of the samples in room light. Note the colour we perceive these samples is primarily due to the absorbance and not due to emissive processes. 1. DeltaPro and DeltaDiode DD510L with no sample. The sample transmits light through onto a piece of card at the back. 2. DeltaPro and DeltaDiode DD510L with water sample. The sample transmits most of the light through onto the piece of card at the back as before. 3. DeltaPro and DeltaDiode DD510L with LUDOX suspended in water sample. LUDOX consists of silica (glass) nanoparticles and light scatters off these as a result there is an intense green beam observed throughout the Ludox. This type of scattering called Rayleigh scattering is elastic and retains the same wavelength (colour) as the excitation light. There will also be another type of scattering that is inelastic called Raman scattering which is dependant on molecular vibrations of the sample molecules. Raman scattering is incredibly weak compared to Rayleigh scattering and hence not observed by eye in this example. Scattering can be a huge problem in spectrophotometry and is handled better in fluorimetry. 4. DeltaPro and DeltaDiode DD510L with fluorescein suspended in water sample. Fluorescein is a dye commonly used in many fluorescence applications especially within the life sciences. A common pupose is use by opticians to check the eyes. The DD510L is not the optimal wavelength for fluorescein as it coincides with the maximum value of the fluorescence. In this case a cyan laser (488 nm) such as a DD485L is more optimal. However weak fluorescence can be observed as it passes through the sample. 5. DeltaPro and DeltaDiode DD510L with Rhodamine 6G suspended in water sample. The fluorescence of Rhodamine 6G is strong and an intense yellow emission is clearly distinguished from the green excitation light. 6. DeltaPro and DeltaDiode DD510L with ADOTA suspended in water sample. The fluorescence of ADOTA is strong and an even more intense yellow emission is clearly distinguished from the green excitation light. We can see that the green excitation light when looking straight through the sample i.e. the beam on the card appears to be mostly green coming from the excitation source and the yellow fluorescence can barely be seen in contrast. In fluorescence measurements one wants to measure the yellow fluorescence in absence of the green excitation light and for best signal to noise this is usually done using a right angle measurement. A long pass filter or monochromator or combination of both can be used to separate out these signals before placement of a detector. We may take an emission spectrum as demonstrated below in a fluorimeter. In my case using a modular FluoroLog 3-22. Taking the Rhodamine 6G sample from earlier, I am going to excite at 500 nm this time using a Xenon Lamp as an excitation source instead of a DD510L and measure an emission spectrum at wavelengths higher than the excitation wavelength and sum of slits in this case 520-700 nm. To reduce stray light (light passing through the monochromators at the wrong wavelengths from the Xenon lamp) a double grating monochromator is preferred for a Xenon Lamp. The excitation arm of a fluorimeter is more or less identical to the spectrophotometer shown before however the sample chamber has been removed and only ~8 % is directed onto the detector in this case called the Reference R. The remaining ~92 % of the light is directed onto the sample. Fluorescence as mentioned is collected at right angles and a second monochromator is present in front of the detector S.
Two raw signals are measured. Essentially a small fraction of the light source gets redirected to a photodiode just before the sample. The current across the photodiode is measured and used as a Reference for the lamp output. S – Signal – To avoid spectral distortion due to detector pile-up (discussed later) the maximum Signal should be kept within the linear regime of the detector. On the other hand two low a Signal will give a poor quality spectrum. Slit bandpasses need to be altered to optimise a measurement. A number of corrections are then typically performed. The first correction accounts for any fluctuations in the lamp output and accounts for the non-uniform illumination across wavelength. For instance the Xenon lamp output is typically much weaker in the UV. Moreover, the Xenon lamp which is a consumable may have a declining output with respect to time this correction means data should be comparable between a new lamp and a lamp operating in the middle of its working lifetime. Sc – Corrected Signal accounting for dark counts and multiplied by the Emission wavelength correction factors. Rc – Corrected Reference accounting for dark counts and multiplied by the Excitation wavelength correction factor. I advise measuring all signals in a Steady-State instrument with two scanning monochromators. One may also measure an Excitation spectrum. This time holding the emission monochromator constant at 550 nm and measuring emission when the excitation wavelength minus the sum of slits is lower in this case 400-530 nm. The same 6 signals should be measured. One will see the importance of the division by R as the Xenon lamp lines clearly distort the excitation spectrum. As mentioned the quantum efficiency of the detector is the main culprit for the non-linear wavelength response. The efficiency of gratings, polarisers and other optical components also play an important role. These standards are measured using each instrument and a correction file is made by dividing their certified spectrum through by the measured spectrum. With respect to the Emission Wavelength Correction Factor MCorrect, the Excitation Wavelength Correction Factor is relatively insignificant. It is usually measured using either a calibrated PhotoDiode or a Quantum Counter such as 8 mg/ml Rhodamine B in 1,2 propandiol at Front Face Configuration and measuring an excitation spectrum at 650 nm emission with a LP610 nm-LP630 nm filter. The quantum counter is a sample which effectively has a constant yield over a workable wavelength range. The emission from a quantum counter with respect to excitation should therefore correct for the response of the excitation optics particularly the photodiode. If you wish to measure correction factors see my PhD thesis for more details. The incident photon interacts with a photocathode which ejects an electron thats focused onto a dynode chain. As the electron hits the first dynode, more electrons are released, these hit the second dynode chain and this continues along the chain until a sufficient signal is reached at the anode. If the voltage is above a certain threshold it is prescribed to a count. What can also happen in the absence of light is that an electron may thermally shake loose near the beginning of the dynode chain. This can then release more electrons in being released across the dynode chain until the anode anode. If the voltage is above a certain threshold it is prescribed to a count. This of course is not a count due a photon it is a false detection otherwise known as a dark count. These dark counts are temperature dependent and cooling the PMT will reduce them. There is always a trade-off between spectral resolution, fluorescence throughput as the monochromator bandpass is opened up. If one is measuring a sample which has two closely resolved peaks λa and λb such as a Raman signal (left) with a spectral bandpass thats sufficient Δλ (centre) the measured spectrum (right) should resemble the real spectrum (left). The schematic illustrates the number of counts being measured as the emission monochromator grating is scanned. The number of counts measured per central wavelength is equivalent to the red-cross hatching. If one is measuring a sample which has two closely resolved peaks λa and λb such as a Raman signal (left) with a spectral bandpass thats too large Δλ (centre) the measured spectrum may lose spectral resolution (right). The schematic illustrates the number of counts being measured as the emission monochromator grating is scanned. The number of counts measured per central wavelength is equivalent to the red-cross hatching. An example of a cyclohexane Raman spectrum excitated at 532 nm using a FluoroLog 3-22 from 540-640 nm using a 1 s integration time and a step size of 1 nm. The spectral bandpasses of each monochromator was varied. If the bandpasses of both monochromators are too low there is insufficient signal to noise measured see the spectrum with bandpasses of 1 nm. On the other hand if the spectral bandpass is too large the spectral resolution is lost see the spectrum with both bandpasses of 5 nm where the 4 individual peaks at 550-580 nm appear to have merged. In the case where one has both a weak signal and wants high spectral resolution, the integration time must be increased. The above spectra show the role of integration time. To the top left where an integration time of 0.1 s per point is used only noise is observed. This becomes slightly better with an integration time of 1 s and 3 s respectively. A decent spectrum is recorded for a 30 s integration time. Difficultly comes when one has a sample that is weak, unstable and they require a measurement with high spectral resolution. One has to tweak these three parameters as best as they can to get meaningful data. Detectors are stated to count linearly within their working regime i.e. PMT detectors have a specified maximum working range. Just above this working range they will still count but at a reduced efficiency. At extreme intensities the detectors may begin to shut off. The following schematic demonstrates the principle of pile-up comparing the working range to twice the intensity of the working range. At the wavelength of peak intensity the most pile-up is observed and hence the lowest counting efficiency. At wavelengths of medium intensity there is a little pile-up slightly reducing the counting efficiency and at wavelengths of the lowest intensity there is no pile-up observed. The spectrum measured is therefore distorted. 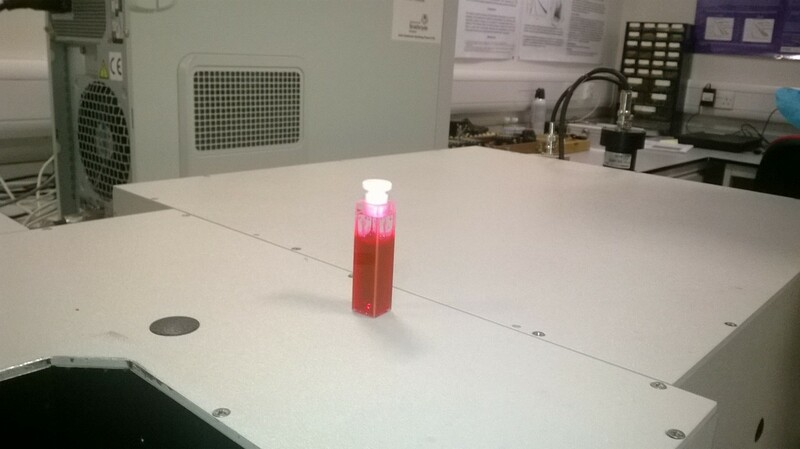 The fluorescence emission of Rhodamine 6G in ethanol measured in a Fluoromax 2. The excitation wavelength was at 475 nm and emission was collected at 540-850 nm. A step size of 1 nm was used with an integration time of 1 s per point. The bandpasses of the monochromators were opened from 0.5-5.0 nm. Top the raw signal measured in counts per seconds. One can see the spectra measured above the linear regime of the PMT (×10^6 CPS) begin to square off. As the count rate is even higher a series of dips are observed. The middle shows the data normalised to 1 where one can observe the spectral widening in more detail. The bottom pane show the corrected normalised data and highlights the fact that correction factors don’t work sufficiently when the signal to noise of the data is too poor. Naturally one can combine the information of the excitation spectrum and the emission spectrum by scanning both monochromators to create an Excitation Emission Matrix (EEM). For an EEM measurement one first performs an Emission spectrum at the starting excitation wavelength. They then step the Excitation Monochromator, measure another Emission scan and continue the process until they reach the upper excitation wavelength. An EEM is a 3D dataset. An example of an EEM of pure water (Starna certified standard) in log scale measured in a Fluoromax 4. Data is collected in 5 nm increments using a 0.2 s integration time. Rayleigh (elastic) and Raman (inelastic) scattering lines are shown as well as low levels of stray light. Any impurities in the water (not present in the standard) would have an excitation emission profile and be shown on the EEM. The problem with an EEM when measured on a system with 2 scanning monochromators is the the time to acquire an EEM. Typically one has to up the spacing for instance, measure every 5 nm instead of every 1 nm or/and a lower integration time e.g. 0.1 s per point instead of 1 s per point. Instead of using an emission monochromator and single channel detector such as a PMT. A multi-channel detector such as a CCD may be used with a Spectrograph. The above illustrates some basic principles behind steady-state fluorescence measurements. I will now discuss time-resolved fluorescence measurements. Advanced readers may wish to see the HORIBA Scientific Fluorescence Spectroscopy European Webinar which covers some more basics about CCDs for use with EEMs.